Can You See Who Views Your Instagram Story, Videos, & Profile? Instagram is a very social place, it’s much more than where marketers show videos and pictures. It’s where friends share adventures, and would-be lovers get curious about those they admire. This leads people to wonder which users are looking at their profiles. Can who views your Instagram Story and other content be found out? In the summer of 2016, Instagram made their own version of Snapchat by launching Instagram Stories. The feature took everyone by surprise and became an instant hit in the Instagram community. Today, Instagram stories have amassed over 300 million daily users. Reverse chronological order: Until a story reaches 50 viewers, Instagram ranks the viewers in a reverse chronological order, with the most recent story view being placed on the bottom. Interaction-based order: After 50 story views, the order of the story list is based on the level of activity between the users. This means that the users that visit the profile of the user, like, and comment the most will be at the top of the of the story viewer list. This is why some people always appear on top of the story viewers, no matter what chronological order they saw the story. Public activity: Public activity includes tagging, likes, comments and other profile-related activity on Instagram. Messaging: The more frequent two people converse in messages, the higher the ranking on Instagram stories between those users. Story interactions: Commenting on stories, voting in polls, and tagging other users in a story all result in a higher story viewer ranking. Profile activities: Activities such as profile views, comments, tags, and likes are included. Profile views are thought to be given the biggest value in this equation. What this means is that those who regularly appear on the top of the Story viewers list are likely the ones that engage the most with the Instagram activity of the user, making engagement a key metric. Instagram videos were first introduced in 2013. The original videos were capped at 15 seconds, but later Instagram lengthened the videos to 60 seconds. Unlike Instagram Stories, which show the exact number and names of the people that see a story, Instagram videos only show the number of the people that have seen the video and the people that liked it. What counts as a view: A view is counted if a viewer clicks on the video to enable sound (the video auto-plays if it’s without sound) or watches more than 3 seconds of the video. Only app views: Instagram doesn’t record views from embedded posts or desktop. It only counts views in the Instagram app. One view each: Each individual Instagram user can amount to a maximum of one view. Instagram doesn’t recognize video loops as repetitive views. A video’s view count is visible to anyone that can see the post. Keep in mind that view count is only available for videos uploaded after November 19, 2015. However, this still doesn’t answer the question who views your Instagram videos the most. So, is it possible to know who is watching your Instagram videos? Facebook has been taking measures to protect user privacy, and this meant many Instagram API endpoints had to be shut down. That is why many apps that provided analytical Instagram services have had to remove many features. The screenshot above is a user review on the InsTrack app on iTunes. 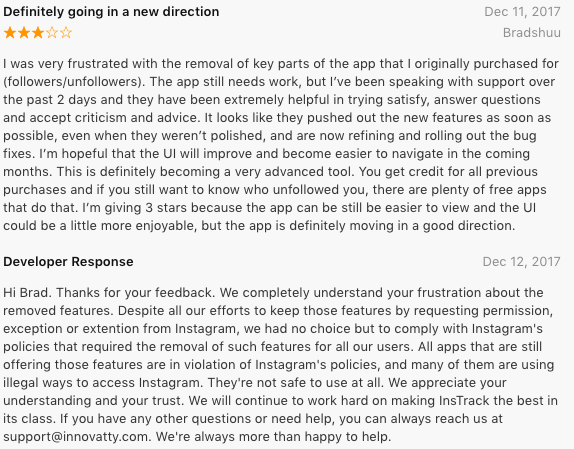 The developer’s reply perfectly sums up the current situation on Instagram that is applicable to every app of this type. This was from a Daily Dot article on the ‘can you see who viewed your Instagram profile’ question. Essentially, what they’re saying is that the Instagram API, which controls what information apps can and cannot access, is not empowered to share information about who is looking at an Instagram account. The reality is that there is no certain way of knowing who is viewing your Instagram profile beyond knowing who viewed your Stories. These apps help users better coordinate their marketing efforts, social media strategy, and content scheduling. A successful Instagram marketing strategy is made by setting measurable objectives and following important metrics, and these tools help create a strong marketing strategy. Successful Instagrammers delve into their Instagram analytics, make the best out of every piece of information, and use information such as story views as an advantage. What they don’t do is obsess over who views every aspect of their Instagram account!